My kid should be President For a Day. Although I keep reminding myself to ignore the newsfeeds with their negative prattle and constant rhetoric, it tends to draw me in. For some odd reason, I feel the need to know what’s going on in the world. But what’s going on just ends up bending those feelings in the wrong direction. What’s far better is to just find joy in the present moment. I took the opportunity this morning to treat us to a father & son breakfast. Just had to leave a little early to make it to (ugh) Micky D’s. The boy got to sit up front in the truck, as he is big enough now to fend off any errant airbag deployment. He appreciated the improved view. Our conversation focused on topics outside the vehicle, things out in the world as it passed by. The falling moon made a game of slipping in and out of the clouds on the way to the horizon. “Oh, that looks so cool now. Look!” he said a few times, pointed finger blocking my view of the traffic. At the restaurant, the McWaiter stood with our tray of colored proteins, patiently waiting for us to fill the shared drink cup with high-fructose corn syrup and FD&C Orange #3. We had yet to choose a booth. Mo picked out a table in the very center, between two large overhead flatscreen TVs. Newsfeeds. Uh-oh. I was deliberate. My attention would be on my happy child, not on Marco Rubio’s angry scowl as he failed to paint Rex Tillerson into a corner about Vladimir Putin. I nodded, and decided to eat the jelly straight out of the package, just to show him it’s okay to be weird. “I want to be President For a Day,” he said. His eyes were on the TV, where a red-faced man with a blonde combover gripped the podium. Perhaps the savory scent of politics has found the little flat nose of my son. “Like what?” I asked. I began to ponder. Gun control? Minimum Wage? Tax reform? Building The Wall? “National Chicken Nugget Day.” he said. “Chicken what?” I asked, itching to know what Martha MacCallum was saying about retired General James Mattis. I heard it all, but my stupid adult brain couldn’t keep up with the childlike wisdom. “What about recess? At school?” I asked. “And Half-Day Fridays,” I agreed. President For a Day dedicates National Chicken Nugget Day as August 19th. For the moment, I had been freed from the chains. Those two TVs ceased to exist in our world. And I could envision it – my ten year old could effectively run the country, and the citizens would be all the better for it. I can’t wait to see him this afternoon, to tell him that the President-Elect of the United States took his advice. 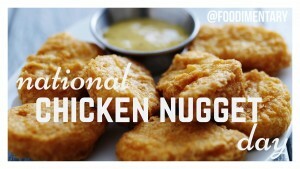 National Chicken Nugget Day is August 19th. this other website says November 13. There are twelve days assigned to NCND. Just pick one and make a calendar appointment in your phone.